Rich in Irony and B Vitamins! Somebody (I'll take note next time and report back) is running ads with female atheletes declaring "sports has no gender." Female atheletes. Who compete in leagues that quite explicitly ban men from competing. Whose entire career depends upon... sports having genders. Ideologies are attempts to replace reality with a dreamworld. 1) The tool social world has heretofore been ruled by a hammerarchy This has created a "hammercentric" worldview that privileges the position of hammers amongst tools, while downplaying the role of screwdrivers. I've been in or on the edges of Wall Street for many years, and Keynes nailed this one: the typical high-level, million-dollar-plus a year employee of an investment bank does not care at all if he walks straight into a financial disaster: what he cares about is that he not stand out from the rest of the crowd who did so as being especially culpable. So long as he doesn't, even if he is fired, he will be employed again at a high salary quite soon. I'm a little confused about your name and role, since line one of your note (below) seems to state that this note is from Cosmo, who is the editor of REM, but the signature says this note is from Wanda, who is the editor of REM. Was your day a little topsy-turvy, perhaps? But hey, let's set aside that minor confusion: which parts of my paper did you like best? Was it the endorsement of the collective ownership of the means of production that really struck you? Or was it the strong position I took against female circumcision? Debugging: don't just fix the bug! Fix the design problem that caused the bug in the first place. Of course, sometimes, it is merely a typo: you wrote "X" when you meant "Y". But more often, the bug is just a symptom: some part of your code is badly designed or too hard to understand, and that is why the bug occurred. Every bug should be looked upon as an opportunity for improving your design. "But glory, honour, and peace, to every man that worketh good..."
He will recognize these as maxims, one stressing the importance of faith, the other of doing good. But if one is of a rationalist bent, these will look like rules, and for Paul to "make sense" one of them is going to have to essentially blot out the other. And thus folks, we give you the Protestant Reformation. You Know You're a Free Thinker! Everyone else has told you to think that you are! The government of Malaysia apparently asked Disney to cut a few minutes from Beauty and the Beast, minutes that the government deemed to be promoting homosexuality. So, of course, Disney, promoters of "multi-culturalism," respected the local culture of Malaysia -- after all, they weren't asking for Disney to insert a segment condemning homosexual behavior! -- and cut those few minutes, right? We have to respect the values of other cultures, and never "imperialistically" assume that our culture is right, and the culture of the other is wrong, hey? Of course they didn't cut that segment! They flat out refused. The "multi-culturalism" of the progressive left is entirely a weapon to wield against traditional Western culture. Whenever some other culture's values differ from progressive ideology, that other culture must be chastised, boycotted, re-educated, or even, if they won't submit, bombed. All three of those lines of code would destroy the red-black tree by wiping out one of its structural components with auxilliary data. It occurred to me that it might be a good idea to have students begin their work by listing each variable they will be dealing with, and what sort of thing it will hold. Then, whenever they are about to assign to it, they can check back to the "pseudo-declarations." But I haven't seen this taught. Is anyone familiar with a place where this is recommended? For Emu86, we had documentation in two places: the source code, and a help file. We needed to get this DRY, and fast! So, we needed a documentation extraction and web page generating system. First I added tags to the source code documentation, like this. See lines 23-36. Then I wrote this program to pull out the tags and everything in between. A single line of code! Then we read the "tagged-text-only" files and turn those into HTML with this program. The last two items could have been a single program, but why clutter up that elegant first program with HTML tagging specific to this project? The program to extract tagged text could be useful in many, many projects: Best to make it standalone, and combine it in a pipeline with other programs. Finally, we use our existing include facility to pull the HTML descriptions of the instructions into our help file. "And being a net recipient of capital is not only not necessarily a bad thing for Americans, but is likely a good thing." What Don means is that for every 100 factory workers who lose their $50,000 / year jobs, one CEO will get a $10 million bonus: net gain! And when was the last time stinkin’ factory workers funded an all-expenses-paid trip to a libertarian convention at a tropical resort?! K2: 0% marijuana, 100% dangerous. "K2 is known as the Savage Mountain due to the extreme difficulty of ascent. It has the second-highest fatality rate among the eight thousanders. With around 300 successful summits and 77 fatalities, about one person dies on the mountain for every four who summit." That for sure counts as 100% dangerous! But was there really anyone out there who thought that it was made of marijuana?! Does that thing look like it is made of marijuana? I received an email rom some Internet scammers today telling me, "You Apple account has been de-activated." Of course, they wanted me to "login" to their fake Apple website to re-activate the account. Thank God so many of these fraudsters are so stupid, or even more people would be victimized by them. I have been watching "India: natures wonderland." In today's segment, some annoying mountain dude has been banging on about the Himalayas. Well, at least the mountain scenery has been pleasant. But then he brought me to a halt: the Himalayas are growing, he noted. (True.) "It's only a few inches a year, but it has been going on for millions of years." This made my inner engineer get out my calculator. How many is "a few"? Let's say three. And how many "millions of years"? He had mentioned that the Himalayas or 40 million years old a bit earlier… Let's say half that time, just to see where we get. So, the average mountain in the Himalayas is around 5 million feet tall. No wonder people need to carry oxygen when going up Everest! Down with the (male) hornbills! What, the female isn't just as good as any male at going out to get food? She doesn't want opportunities out in the world, just like the male has? He's probably out becoming CEO of some big hornbill corporation, while she's stuck at home with a bunch of cawing brats. How dare they! I'd say this species needs a good old American bombing campaign, starting today, until these lady hornbills are liberated from their prisons! * Yes, I realize that she seals herself inside the nest. But certainly, that is just because she has adopted the patriarchical mindset of her oppressors. 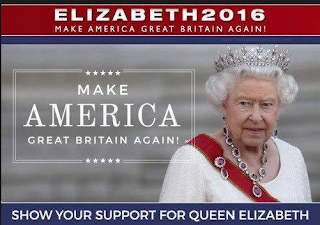 I'm all in favor: the charge is treason against the crown, and the result of the trial will be to place my rightful ruler, Elizabeth II, on the throne. "Gonzaga had seven different players lead the team in scoring in different games this season. They went 28 games before the same person led them in scoring for a second time." This is what you people have been waiting for me to write about... the limits of analytical philosophy?! Well, let me get busy! Ideologues like to help their opponents "become extinct"
Vladimir Lenin promised to purge "the Russian land of all kinds of harmful insects." Ideologies survive by demonizing and de-humanizing their opponents: the world would be, should be paradise, and if it is not, then it must be the fault of monstrously evil people standing in the way of the ideologue's vision. 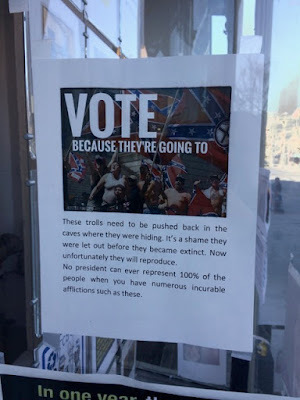 This is from the window of a neighborhood real estate agent who is so insanely anti-Trump that he devotes 80% of his window space to denouncing Trump and 20% to selling real estate. The crowd of people the photo depicts don't look like a pleasant bunch, but it is clear from the context that they are supposed to represent typical Trump voters. This lovely humanitarian is anxiously awaiting the day when 40% of his fellow countrymen "become extinct," since they are, not people, but "trolls" and "afflictions." Macbeth’s self-justifications were feeble—and his conscience devoured him. Yes, even Iago was a little lamb, too. The imagination and the spiritual strength of Shakespeare’s villains stopped short at a dozen corpses. Because they had no ideology. "By properly leveraging blockchain technology we can solve the world's most pressing problems." These clowns are like Charlie Brown, and the latest tech fad promising utopia is like Lucy with her football. 2) Jump cuts when obviously there was no actual jump in what the person was saying. Each of these techniques could be used for an artistic purpose. For instance, number one could signify that a situation is spinning out of control, number two might be used to convey a character's sense of discontinuity in his life, and number three could express the idea that somehow the dialogue being spoken led directly into or foreshadowed the new scene. My review is now essentially complete, and is online here. Worst Apple voice recognition mistake yet? I just tried to dictate the word "notion" on my Mac, and found 'knowshon' put in my document instead. Apparently there is some football player named 'Knowshon.' Fair enough. But how in the world is that a more likely interpretation of what I spoke than 'notion'? "The second point [Eliade gets wrong] is that the gods are designated as 'supernatural Beings.' That, of course, is impermissible. The term supernatural, as opposed to an natural, is Scholastic terminology very commonly used by Thomas Aquinas. From Scholasticism, as part of dogma, it entered into the dogmatism of the Enlightenment in the 18th-century." -- Eric Voegelin, "The Drama of Humanity"
I swear I had not read this before making a similar point myself a couple of months ago. I recall, at a progressive college, seeing a poster in the hallway proclaiming: "My only handicap is in your mind." The image accompanying the slogan showed a man in a wheelchair, with no legs. I don't know what happened to his legs. He may have lost them in an act of extreme heroism, e.g., saving Iraqi children from a landmine. He might deserve medals, and parades, and cash compensation. But I know for sure he has a handicap that is not in my mind: he has no legs. He can't walk. He can't run. He can't go for a hike. To get around, he has to use a wheelchair. That is why, in the photo, he is in a wheelchair. These handicaps do not make him less of a person, in the important, spiritual sense, than me or you. But they are real, and not just in anyone else's head. In classical Athens, crimes fell into one of two categories. There were private crimes such as theft, assault, and murder. Charges for these crimes could only be brought by the victim, although, in the case of murder, obviously this would have to include the victim's family. Then there were public crimes, which were considered to harm the state as a whole. Any citizen could prosecute one of these crimes. In this category were included treason, extortion of state funds, and... adultery! Someone who committed adultery in Athens at this time certainly might have tried to hide the fact, by, say, denying they had done so. But if accused, one thing they never would have done would be to tell the accuser "It's none of your business." That answer would have made as little sense to a contemporary Athenian as it would today to tell the police, about the shooting victim lying on your living room rug, "It's none of your business." For instance, my phone: One day, if it was plugged in in my car, and I turn the car on, it started announcing how many minutes I was from home. This happens every time I turn the car on for several months. Then one day, it stopped doing that, and has never done it again. I have no idea what started it going like this, and no idea what made it stop. My latest, co-authored with Texas Tech economists Alexander Salter. I continually try to refine and clarify my thoughts about ideology, since the dominance of ideology in public life is the great problems of our age. Let's say "anti-materialists" point to EPR effects to try to demonstrate that materialism is an incomplete description of reality: E, P, and R devised their thought experiment precisely to show that the Copenhagen interpretation of Quantum Mechanics is unsatisfactory, because it implies that "spooky action at a distance" exists, contradicting materialism (as it was then formulated). But when experiments seem to show that there is "spooky action at a distance," then materialists simply say, "OK, well then that is part of material reality as well."